POLISSE is a French drama about the Child Protection Unit of the Paris police force that investigates crimes against children, mostly of a sexual nature. Writer/director/star Maiwenn actually spent time with the real Paris CPU, and all the cases in the film were based on real crimes. Given that background and the film's gritty, almost documentary feel, one would expect some powerful and affecting moments. And there are some, but not nearly enough. POLISSE has a similar feel to Lee Daniels' PRECIOUS in that it deals with serious, disturbing subject matter in a way that occasionally goes so far over the top as to border on camp. Investigating the kind of crimes we see in POLISSE day after day might well lead one to develop a dark sense of humor as a coping mechanism, and that's understandable. That this film should approach the subject with an equally jaundiced eye, however, seems less so. Questions of tone aside, there are other less subjective problems with POLISSE. Chief among these is a large ensemble cast that Maiwenn seems incapable of juggling. There's also not much of a plot, just a parade of the horribles as characters so thinly defined as to be little more than cop show cliches hop from one sordid, unresolved case to another while dealing with an overwhelming surplus of personal issues. To some degree, this does serve to give a sense of how overwhelmed the CPU must be, but it also results in a film that lacks focus. 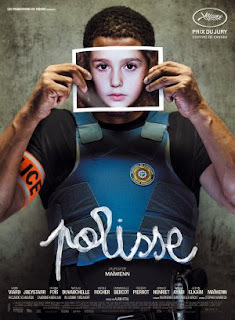 The only thing really tying POLISSE together is a photo journalist played Maiwenn herself who is assigned to cover the unit. This character could have served as an unobtrusive audience surrogate and been effective as such, but the film feels the need to have her become involved in an unconvincing romance with one of the officers. The magic moment when she wins his heart happens when she takes off her glasses and lets down her hair, suddenly standing revealed as a beauty. That schtick was already corny by the fifties, but here it's played totally straight. It's all topped off with an ending that was probably meant to be grim, powerful, and thought provoking but instead comes off as contrived and absurd. 2 out of 4 stars. "The only thing really tying POLISSE together is a photo journalist played Maiwenn herself who is assigned to cover the unit." maybe when you learn to write in proper english, your analyses will become more credible. i don't know what film you saw, but certainly not the *polisse* i watched and loved. Wow, you caught me. I forgot the word "by" and didn't manage to catch it during the editing process. I guess that makes the substance of my review moot. Certainly no other reviewer, be they an unpaid blogger such as myself or a high profile journalist writing for a major newspaper, has ever made a similar mistake. Guess it's time for me to hang up my writin' spurs and ride off into the sunset.